This 21-chord Autoharp plays in eleven different keys. The traditional button configuration makes it easy to learn and to continue to play for years to come. 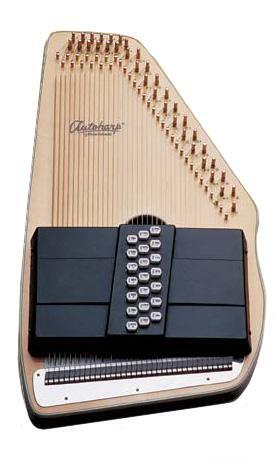 This autoharp is also known as the Centurion. Since there were very few models produced back in the day, the autoharps were assigned names rather than model numbers. “The Oscar Schmidt OS100 21 Centurion 21 chord autoharp is a great mid-level autoharp that combines the great tones of spruce wood and mahogany. The body of the OS100 21 Centurion features a solid spruce face and a mahogany back. This combination of woods will provide you with a great sounding instrument as well as some cost savings. The OS100 21 Centurion features a glossy finish that brings out the beautiful colors of the mahogany and spruce. The glossy finish will also dampen the sounds slightly as the finish is very thick. The Oscar Schmidt autoharps feature a rock maple frame that goes around the entire instrument. The tuning pegs are held in place by a 10 ply rock maple block. The OS100 21 Centurion features a large sound cavity and will produce a great sound from this autoharp. Oscar Schmidt autoharps have received a few running updates to make the playing of your autoharp even more enjoyable. The felt on the chord bars is now thicker which will not allow the chord buttons to become flush with the faceplate of the autoharp. Also, some autoharp players were concerned with the clicking noise the chord bars created when they came into contact with the cover. Oscar Schmidt listened and now has placed a felt dampener on the backside of the cover to help remove any noise that the chord bars may make. This autoharp features a solid spruce top and the purest overtones of any autoharp Oscar Schmidt offers. Solid spruce top is the industry tradition in all instruments, guitar, clarity and projection of sound. The gloss finish not only provides an added layer of protection, but it also affects the vibrations, creating a slightly lower sound. The back of the body is made with select maple wood, designed for strength and optimal support. The backside also features a beautiful wood pattern design. Invented in 1882, the Autoharp has had a remarkable hundred-year history. After being proclaimed“the nation’s favorite musical instrument” and then nearly fading into obscurity, the Autoharp has taken its manufactures on an endless roller coaster of ups and downs. As a nineteenth-century parlor room favorite, it was finally replaced in popularity by the phonograph. The Autoharp did not die. It retreated to the mountains where it underwent a metamorphosis from a parlor instrument to a folk instrument. From there it came out into our schools to become a classroom feature and finally, has emerged as a popular instrument for the serious musician.